Global Monitoring of POPs using Beached Plastic Resin Pellets. 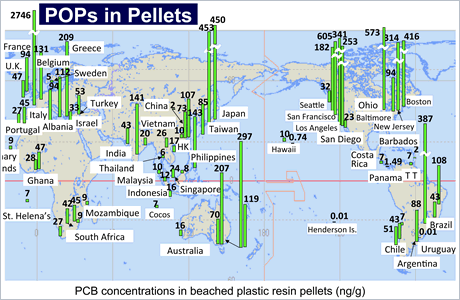 Global monitoring of POPs by using beached plastic resin pellets. IPW is a volunteer-based global monitoring program designed to monitor the pollution status of the oceans. Since its launch in 2005, ~ 80 groups and individuals from ~ 50 countries have been participating in this project to cover ~ 200 locations around the world. We focus on persistent organic pollutants (POPs) such as PCBs and organochlorine pesticides. Because of their bioaccumulative nature and adverse effects on marine organisms and humans, POPs are regulated by an international treaty (i.e., Stockholm Convention). IPW is based on the fact that POPs are accumulated in resin pellets (plastic raw material) from the surrounding seawater by a factor of millions. Similar accumulation occurs with broken plastic fragments in the ocean. Pellets are surrogates for all marine plastics. IPW reveals the magnitude and spatial variability of POPs in marine plastics for risk assessment. IPW has demonstrated that marine plastics transport POPs in marine environments, even to remote areas. Studies related to IPW also demonstrated the transfer of POPs from ingested plastics to the tissues of biota that mistakenly consume marine plastics. Our areal coverage is still limited. IPW is still going on. If you would send pellets from your near-by beaches, it would be great for saving our planet. We got first set of data on polybrominated diphenyl ethers (PBDEs) in pellet samples collected from 43 locations of 24 countries. PBDEs are flame retardants compounded to plastic products and chemical fibers. Most of them are regulated by Stockholm Convention. However, they have been continuously released to aquatic environments from waste plastics and fabrics. Our study with Prof. Izumi Watanabe, Mr. Takashi Tokumaru, and Ghanaian collaborators has highlighted the emission of PBDEs from electronic waste (E-waste). 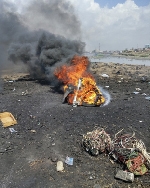 We detected considerably high concentrations of PBDEs (14 – 21 ng of sum of 46 BDE congeners per g-pellets) at several locations near world biggest E-waste site (Agbogbloshie) in Ghana. These concentrations are comparable to those found in western European countries (0.69 – 13 ng/g) followed by USA (17 – 39 ng/g; except for one rural site) and no such high concentrations of PBDEs were observed in the other African countries including Kenya, Mozambique, South Africa whose PBDE levels were less than 3.9 ng/g. The study has underlined the importance of pellet watch to analyze PBDEs and related chemicals near e-waste sites in the world. This study was partly supported by UNU-IAS. Statement “Plastic bag regulation: top priority given at the United Nations HQ, Informal Consultative Process on Oceans and the Law of the Sea, 2016” was presented in response to the New York State government bill that would block the New York City Bag Law, due to go into effect on February 15, 2017.
International Pellet Watch is still going on and active. In 2015 and 2016, we have been receiving many pellet samples from various locations in the world and have been analyzing them, though we were lazy with reporting the results and releasing them through this blog. In 2017, we will be more actively releasing the analytical results. We got progress with publications of the analytical results such as case studies in Vietnam, Brazil and Australia as follows. Temporal and spatial changes in persistent organic pollutants in Vietnamese coastal waters detected from plastic resin pellets. by Dung Quang Le, Hideshige Takada, Rei Yamashita, Kaoruko Mizukawa, Junki Hosoda, Dao Anh Tuyet, Marine Pollution Bulletin, 109(1), 320-324, 2016. Spatial variability in persistent organic pollutants and polycyclic aromatic hydrocarbons found in beach-stranded pellets along the coast of the state of Sao Paulo, southeastern Brazil. Satie Taniguchi, Fernanda I. Colabuono, Patrick S. Dias, Renato Oliveira, Mara Fisner, Alexander Turra, Gabriel M. Izar, Denis M.S. Abessa, Mahua Saha, Junki Hosoda, Rei Yamashita, Hideshige Takada, Rafael A. Lourenco, Caio A. Magalhaes, Marcia C. Bicego, Rosalinda C. Montone, Marine Pollution Bulletin, 106 (1-2), 87-94,2016. 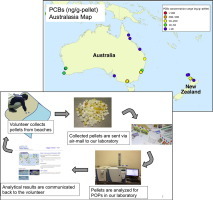 POPs monitoring in Australia and New Zealand using plastic resin pellets, and International Pellet Watch as a tool for education and raising public awareness on plastic debris and POPs. Bee Geok Yeo, Hideshige Takada, Heidi Taylor, Maki Ito, Junki Hosoda, Mayumi Allinson, Sharnie Connell, Laura Greaves, John McGrath, Marine Pollution Bulletin, 101 (1), 137-145, 2015. Dr. Hideshige Takada. All Rights Reserved.